CBRE's latest research on China real estate capital markets has revealed that mounting debt and a lack of financing options could spell opportunities for investors. Figure 1: Corporate bonds due for repayment by listed Chinese developers. Figure 2: Capital sourced by domestic developers from domestic bank lending. Figure 3: National residential sales volume. Chinese developers’ mounting debt has made headlines in recent months, according to CBRE, with listed domestic groups facing around USD $110 billion of debt repayments between 2018-2021 while still remaining subject to restrictions on financial borrowing. While debt maturity remains a concern, CBRE Research believes the risk of a marketwide default is low. Major national developers are likely to see smaller developers come under increasing strain, which is likely to force some groups to sell projects to larger competitors and may stimulate some merger and acquisitions (M&A) activity. 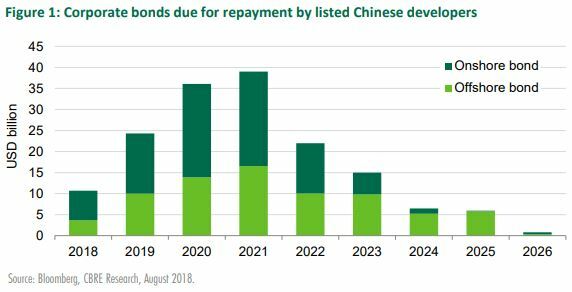 The Viewpoint by CBRE Research examines credit risk in the Chinese real estate market and explains why developers' debt may provide opportunities for selected investors. 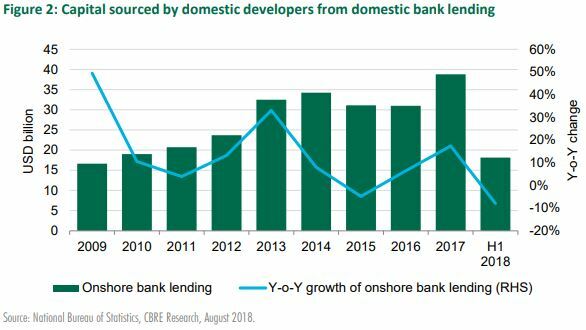 Beginning in 2015, a series of monetary easing measures by the People's Bank of China (PBOC) facilitated an increase in bank lending to domestic developers. However, the tide began to turn in January 2018 as the central government shifted towards deleveraging. In 1H 2018, the total volume of domestic bank lending for real estate fell by around 8% YOY compared to the same period of 2017. 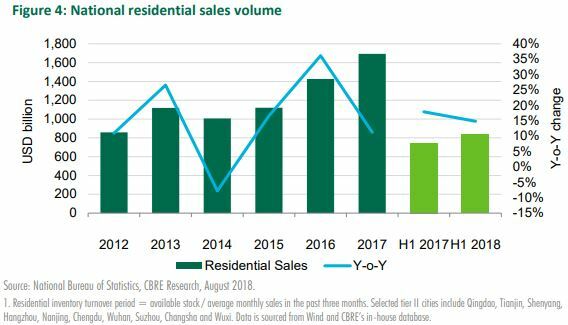 The impact of the tighter financing environment has been somewhat offset by the positive national residential sales market, in which transaction volume surged to RMB 5,700 billion (USD $861 billion) in 1H 2018, an increase of 15% YOY. This has provided developers with stable cash flow, with income from pre-sales increasing 12% YOY during the same period. Solid residential sales have ensured the inventory turnover period in tier I and selected tier II cities remains under 12 months, which has strengthened developers' ability to meet debt repayments. CBRE Research expects the tight lending environment and the potential slowdown in residential sales to increase the strain on small and medium-sized developers in the coming months. Large developers will be relatively unaffected as they can enjoy relatively lower interest rates due to their better credit rating. The data reveals China's property market to be in healthy shape, with occupier markets reporting strong leasing momentum, the country remains a magnet for investment from foreign investors, especially from within Asia. Nevertheless, the higher cost of funding and continuing tight government restrictions are set to add to the financial burden on domestic developers in the second half of the year. Combined with the impact of slower residential sales, this will create significant opportunities for investors as smaller groups come under pressure. Above all, however, it should be restated that while debt maturity remains a concern, the likelihood of a market-wide default is very low. Large domestic developers are in good shape and are able to access funding from various sources. Click here to view CBRE Research ViewPoint report. For more information or to discuss the report, phone or email Sam Xie CBRE Head of Research, China via the contact details listed below. This article was originally published on RETalk Asia. Will China developers go asset light?